PAOK FC have unveiled their new jerseys for the 2018-19 season. The players will first appear with the new kit on Tuesday night in the UEFA Champions League second round qualifier against Swiss club FC Basel. PAOK's home jersey remains black and white, however, this season the stripes on the jersey will be much thicker in comparison to what they were in the previous season. The striped kit will only have two black stripes on the front of the shirt while the shorts will be a solid black color. 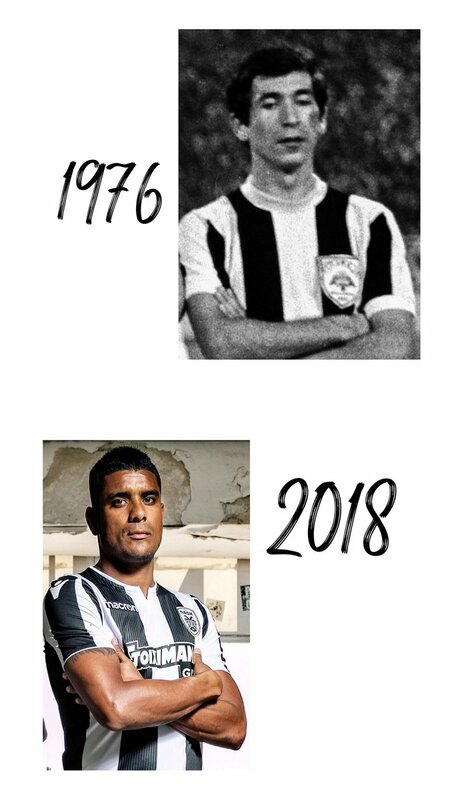 PAOK’s new jersey is a flashback and inspiration of their 1975/1976 kit, when the club won their first league title. The Thessalonikis have looked back to glorious moments in the club’s history and have taken influences from the past and implemented them into the club’s new jersey. PAOK’s new jersey comes with a meaningful message and slogan which states “In districts and on the streets, people were born" which is located on the bottom of the jersey. George Savvidis, the son of controversial President Ivan Savvidis, revealed the slogan when he posted it to his Instagram yesterday. The retail and sales manager of PAOK FC, Kostas Zotos, indicated via social media how crucial it was that this season’s jersey had a story behind it, giving the jersey an extra added meaning. He added that the club continues to get ideas and opinions from the loyal PAOK fan base throughout the designing process. PAOK’s away jersey is a totally grey kit, which gives the kit a more classy and modern look. The jersey will be worn with grey shorts giving the players an all grey look for this upcoming season’s road matches.